I’m going to do something I’ve never done before and that is ask readers of this blog to contribute money to a project. 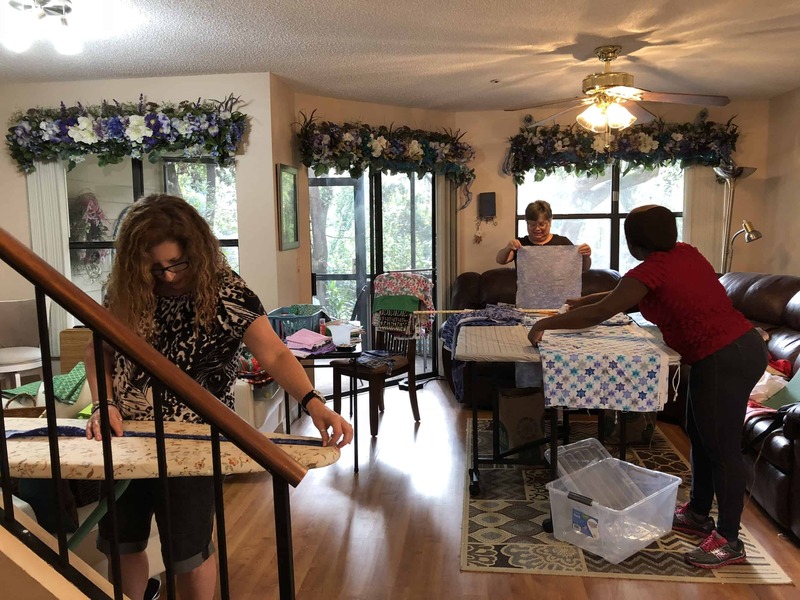 The TL:DR is my mother, friends, and I have been sewing pillowcases for kids in the hospital. We’re looking for help covering the costs of materials and shipping. Our goal is 600 pillowcases this year. If you’d like to contribute, follow this link to our PayPal Money Pool. Keep reading for the full story! Thank you for any help you are able to provide. Fabric that needs to be ironed and cut to size for pillowcases. In March 2017, I took a class at the Florida Tropical Weavers Conference. We wove fabric using rags and then sewed the fabric into cute purses. I always knew that I was going to need to improve my sewing skills if I was going to weave my own fabric, but I didn’t have a specific plan for when I was going to do that. After taking the class at Conference, I decided the time was now. I took three classes at The Sewing Studio, an independent fabric shop located about 10 miles from my house. Each class was once a week for four weeks. In the first class, we sewed pajama pants. In the second we sewed a tunic and in the third we sewed a dress. After the fabric is cut, we make it up into kits. Each kit includes the main fabric, a contrasting trim, and a contrasting cuff. The sewists take a kit out of this box and start sewing. About the time that I was starting the second class, my mother told me about the pillowcase project. My cousin is a nurse on a pediatric oncology unit at Hartford (Connecticut) Children’s hospital. Someone gave them a few handmade pillowcases to give to the kids. The nurses gave them out on special occasions or if a kid had a particularly rough day. They didn’t have many pillowcases, so they were careful about giving them out. My aunt and mother had sewn a few pillowcases. My mother wondered if I’d like to make some also, as a way of improving my confidence in basic sewing skills. I said sure. This me, sewing a pillowcase on the used sewing machine I found for less than half the usual retail price! Of course it snowballed from there. 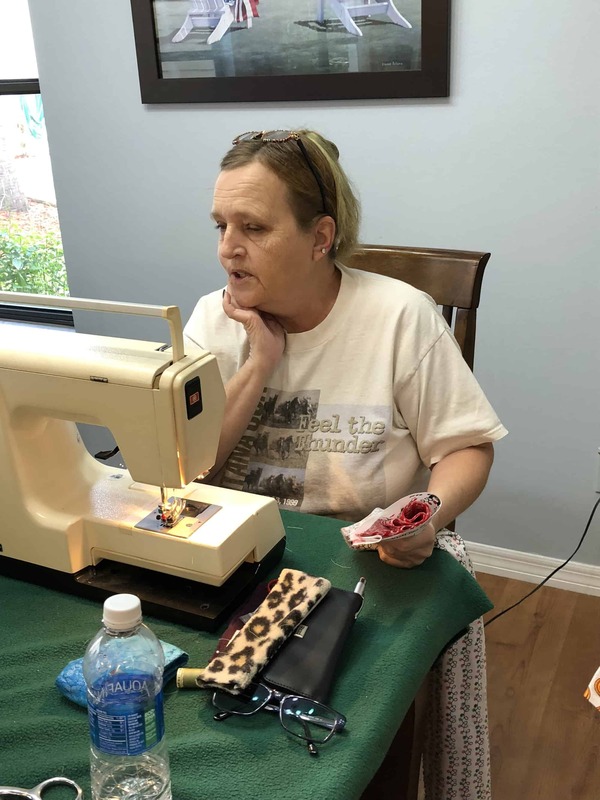 My friend Shellee wanted to learn to sew, so we taught her the very basics with pillowcases. Shellee is a lot like me — if she’s going to get into something, she’s jumping in with both feet. 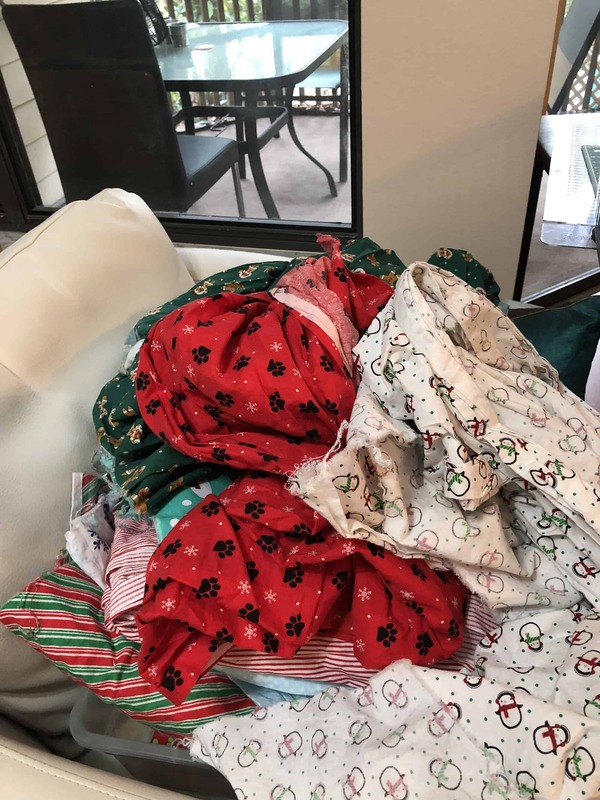 Before you knew it, my mother, Shellee, and I had acquired far more fabric than we could sew through ourselves and we started recruiting other people to help. Shellee and I ironing and cutting fabric. We’ve held a couple of sewing days for the pillowcases. At first it was just Shellee, my mom, and me but in November we recruited as many people as we could in order to sew pillowcases for December holidays. My mother’s neighbor Bonnie doesn’t sew, so she did a lot of the ironing. My mother and Shellee are in the background, measuring and ironing. My mother’s friend Maria Elena does not know how to sew, so she helped with ironing. In this picture, Fredi is preparing one of the kits for sewing. 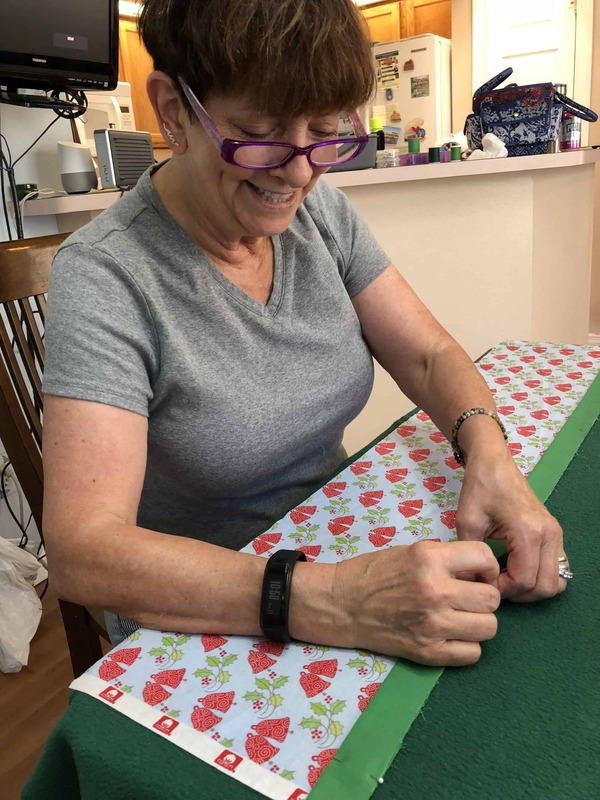 She is also a talented sewist and we were excited to have her helping! Cris’s machine gave her some fits, but she got them worked out and sewed the rest of the day. Shauna has been sewing a long time. Before she moved to Florida, she volunteered significant time with Girl Scouts of America. 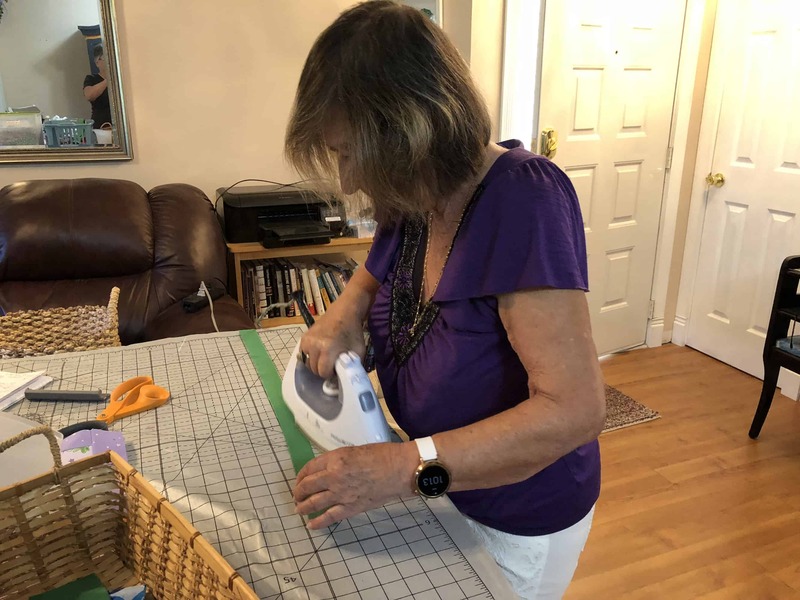 She was looking for a new volunteer opportunity here in Florida and was excited to sew pillowcases with us. 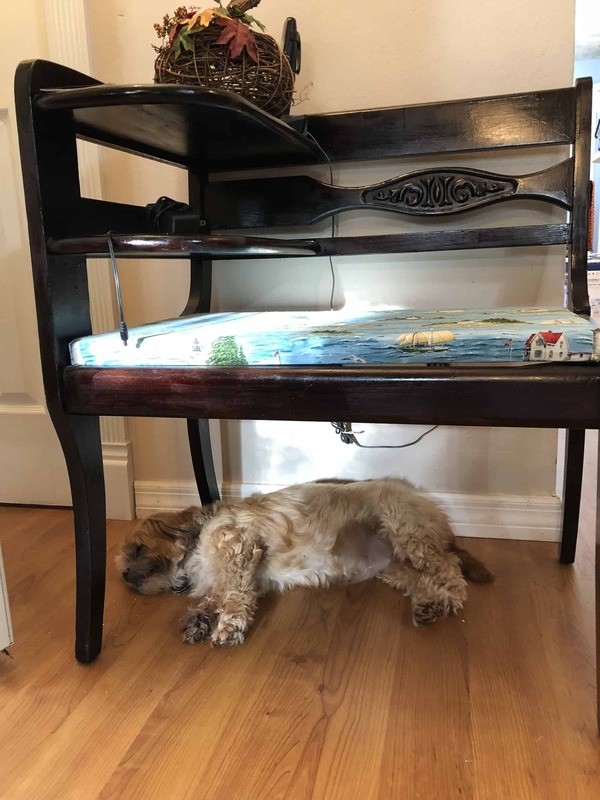 My parents’ dog Kallie supervising the sewing. I wish I could share pictures of kids with their pillowcases, but I can’t due to HIPPA and general privacy. I do have stories, though! 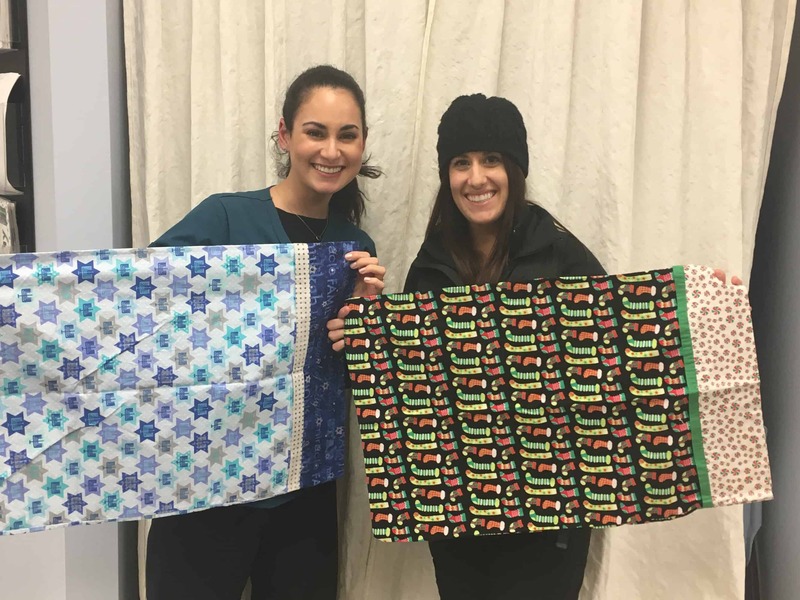 Two nurses holding up holiday pillowcases we sent to the hospital. Some patients come in and out of the hospital. Sometimes the patient comes in for regularly scheduled treatments. They might stay in the hospital for a week every month or for a couple of days a week while receiving chemo or radiation. Sometimes the patient comes in on an irregular schedule as symptoms wax and wane. One boy received a pillowcase on a visit several months ago. Every time he comes into the hospital again, he brings his pillowcase with him. He can’t fall asleep without it, even at home. Just before Christmas, another boy came into the hospital. He loves Christmas and was going to be in the hospital over the holiday, so his family decorated his entire room for Christmas. They were so excited when Avery brought him one of the Christmas-themed pillowcases as a finishing touch on the room. His mother was so touched when she found out they were handmade. She took a picture of her son sleeping on the pillowcase and had Avery sent it to us so we would know how much it meant to them. While most of our pillowcases stay on the floor where Avery works, sometimes they make their way to other floors. 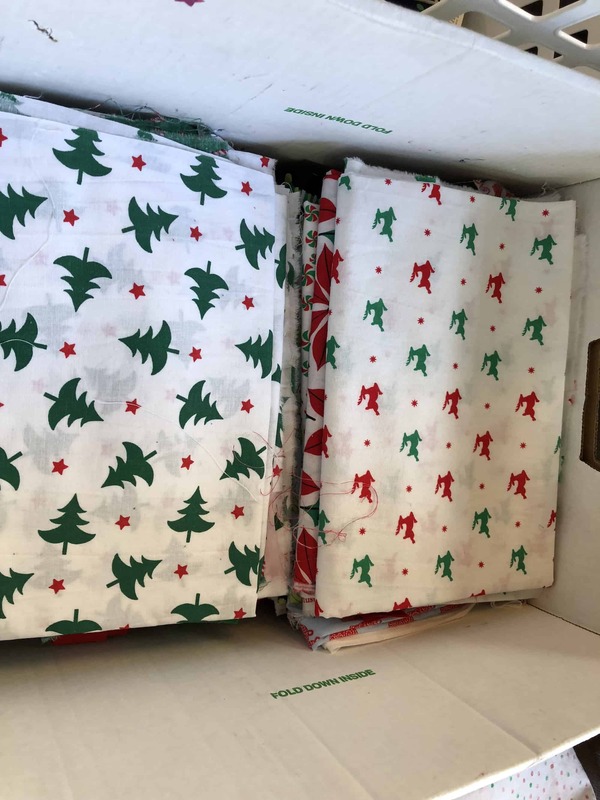 When we sent 8 or 9 pillowcases made from “Happy Birthday” fabric, the woman in charge of special events for patients commandeered them all so she could distribute them throughout the hospital to kids who had to spend their birthday as an inpatient. When you click through to our PayPal Money Pool, you will see that our goal is $6,000. I thought I’d break that down for you a little. The primary cost is for fabric. Each pillowcase takes about a yard of fabric. We use three different fabrics — one for the body, one for trim, and one for the cuff. The total body is about 3/4 of a yard, the trim is about 3” long and the cuff is 10” long. We use quilting cotton to make them and are using nearly the entire width of the fabric. We tend to cut out pieces first for the body, then for the cuff, then for the trim so we can maximize our use of the fabric and have very little waste. At regular price, quilting cotton costs $4 – $12 / yard. The lower cost fabrics are definitely lower quality. We found that they are often skewed to an extent that it is difficult to make a pillowcase with them. In addition, they tend to have smaller all over patterns and don’t necessarily have the visual impact we like. The high end of the range is either a better quality fabric or one that has licensed characters on it. So far, we have mostly purchased mid- or high-price range quilting cottons when they are on sale and, hopefully, in combination with a coupon. As a result, we have kept our average fabric cost at about $6 / yard. We usually make pillowcases using either licensed characters or holiday themes. The pictures in this post are all Christmas and Hanukkah. We also made pillowcases for the 4th of July, Halloween, and Thanksgiving. The other costs are thread, which runs about $5 / spool for the sewing machine thread and $9 / cone for the serger thread. In September and October, we went through several spools of black sewing machine thread! We usually have one serger threaded in black and another threaded in white. We use whichever looks best with a particular fabric and don’t try to have multiple colors to precisely match fabrics. For the winter holidays, we had one serger in red, one in green, and one in white. Since there is so much thread on serger cones, we haven’t gone through a complete set yet. We also try to buy thread on sale and with coupons, and are usually able to get it at half price. The remaining two costs are shipping, which runs about $0.50 / pillowcase, and sewing machine maintenance. 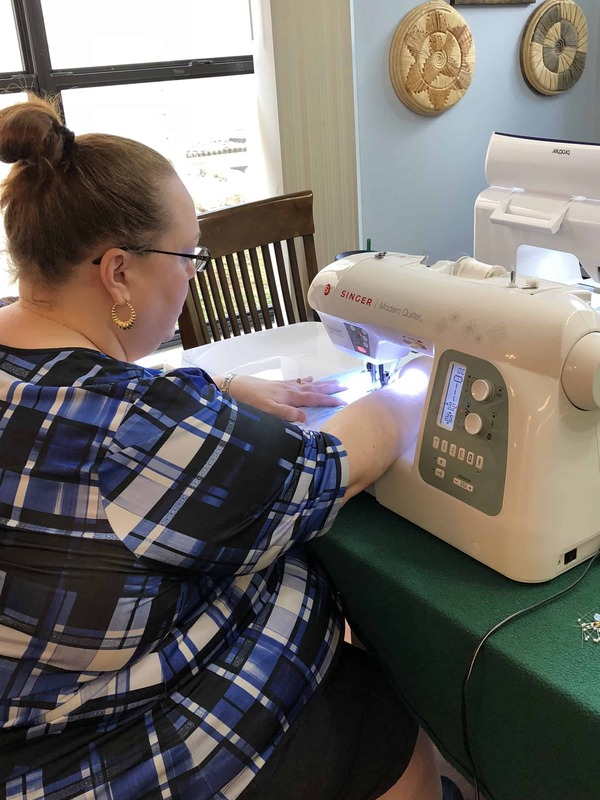 We haven’t had to do maintenance on our machines yet, but with as much as we plan to sew this year, we will probably need to do maintenance on at least three sewing machines and three sergers this year. Maintenance is $50 – $100 / machine, depending on the machine. In 2017, we sewed approximately 250 pillowcases. As quickly as we sent them, they were distributed! We could not keep up with the demand. Our goal for 2018 is 600 pillowcases. Our $6,000 goal gives us a budget of $10 / pillowcase. This gives us a slightly more generous fabric budget than we’ve been spending, maybe $8 / yard, so we can use higher quality fabric and more of the licensed fabrics, both of which are less likely to be on sale. 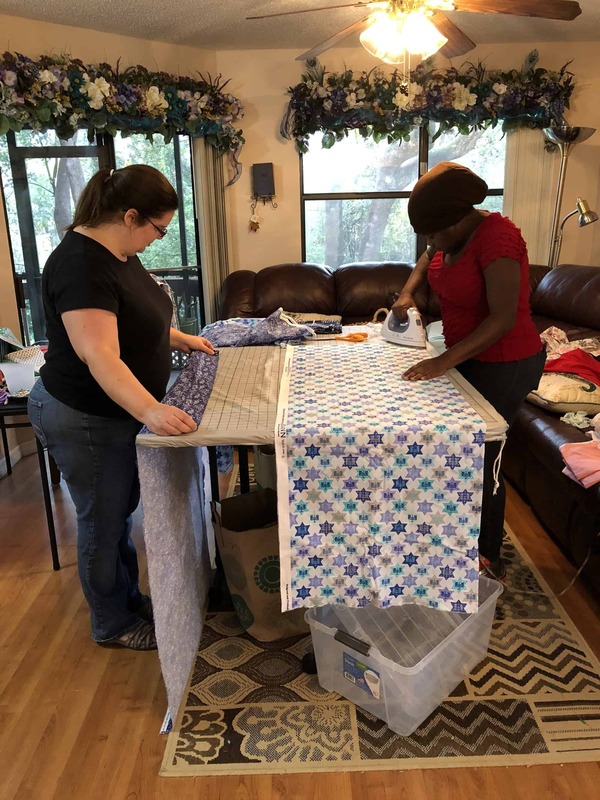 When we first decided that we wanted to do some fundraising so we could expand the number of pillowcases we were making, we researched all the popular options, like GoFundMe and Kickstarter. We discovered just how much you pay in fees on these sites. They all take 4.9% for them plus an additional 2.9% for credit card fees. Some of these services also charge $0.30 / transaction, on top of the percentages. Losing 8% of donations to fees seemed excessive. We hesitated on starting the fundraiser while we looked at different options. Then I found PayPal Money Pool. This service creates a separate pool of money in my PayPal account. In order to reimburse someone who purchased fabric for this project, I have to transfer the money from the Money Pool into my regular PayPal Account, then pay it out to the person. This extra transfer step is always required before using Money Pool money. Best of all, PayPal charges NO FEES for the Money Pool. Every penny donated through our Money Pool will be used to make and ship the pillowcases. Just like GoFundMe and Kickstarter, I get a list of the people who contribute to the pool and their contact information. The landing page of the Money Pool will show a list of contributions — you can choose to be anonymous if you don’t want everyone to see your name — and will keep track of how close we are to making our goal. Services like GoFundMe and Kickstarter provide built in means of providing updates to contributors. I’m not sure yet if Money Pool provides a similar service. 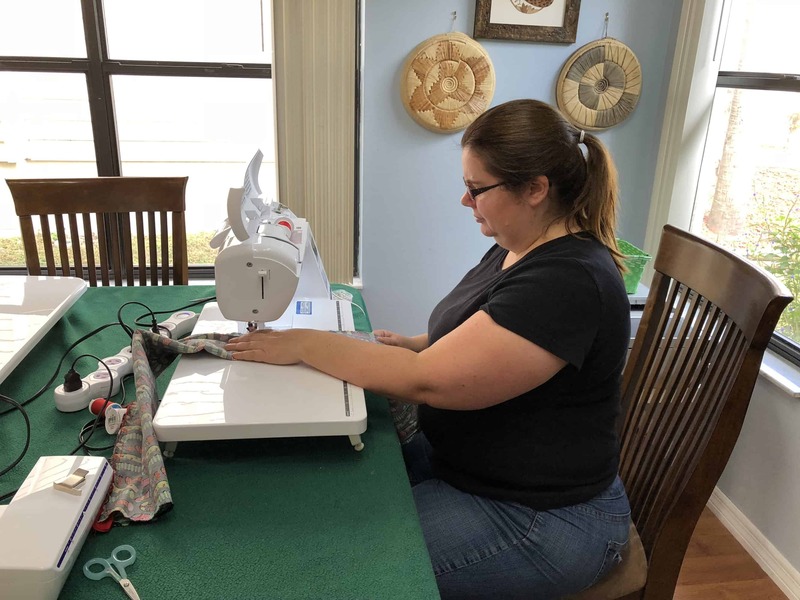 If it does not, I will be creating a e-mail list so I can give you a running tally of the number of pillowcases we sew and a breakdown of how we spend the donations. I will also write additional blog posts throughout the year. Now it’s your turn to help. If you haven’t done so yet, click through to our Money Pool and donate. Every little bit helps and every little bit will be used for the project. Since many of you are crafty people, I suspect some of you may want to donate fabric or make pillowcases yourself. If that describes you, please see the Contact Us page and use one of the contact methods there to request additional information.